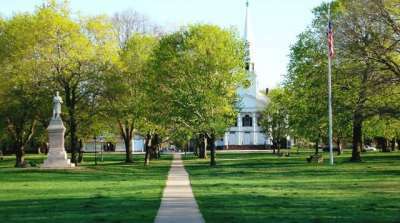 The 22,000 residents of Guilford enjoy a community that Money Magazine calls “one of the top places to live in the country,” not least because of the excellent schools, easy commutes, natural beauty and among the highest median household incomes in the state. On the shoreline east of New Haven, the town is probably best known for its well preserved colonial-era history. In just 47 square miles, the town has one of the largest collections of historic homes in the country, including many from the 1600s. Several of these, like the Thomas Griswold House and Dudley Farm, are now museums that tell the story of early Puritan settlement. In addition to the many public beaches and marinas, private beaches are maintained by associations in shoreline neighborhoods like Sachem’s Head, Mulberry Point and Indian Cove, which were originally developed as summer colonies but now have year-round homes. Guilford has numerous fine restaurants, but the easy-going town also offers fantastic treats like Ashley’s Ice Cream, voted Connecticut’s best, and gourmet malted milk balls at The Village Chocolatier. Bishop’s Orchard is a regional attraction for people looking for fresh apples, cider and pies. An active land trust group maintains an impressive system of trails that feature caves, water falls, salt-water marshes, a tidal lake and natural rock formations. Guilford has a thriving fine arts and performing arts community, headed up by the Shoreline Arts Alliance, which organizes free summer concerts, a series of Shakespeare plays on the Green and an annual arts showcase. The Guilford Public Schools are commonly recognized as among the most successful in the state.